Edward W. Fink, the ex-bookkeeper for the Mermod-Jaccard Jewelry Co., was last week held for the Grand Jury on five charges and his bond fixed at $500 in each case. Fink waived a preliminary hearing. His attorney made a motion to dismiss the case on a technicality, but it was overruled. Fink is charged with taking jewelry from the Mermod-Jaccard jewelry store. The 12 striking plate printers formerly with the Mermod & Jaccard Jewelry Co. have issued a statement to the effect that the trouble was caused by the firm’s employing a non-union workman, who refused to join their organization. They claim that wages are lower in St. Louis than in most large cities. Up to the present time they say they have been unable to effect a settlement. The funeral of Frederick Blanke, the retired watchmaker who died, a week ago-Saturday morning, was held the following Monday from the residence of a relative. Deceased was 75 years old, and formerly worked as a silversmith at the Mermod, Jaccard & King Jewelry Co. The annual May opening of the Mermod & Jaccard Jewelry Co., celebrating the 56th anniversary of the founding of the business by A. S. Mermod, began, Wednesday, May 1, and lasted until Saturday, May 4. The magnificent establishment, with its vast show rooms, was thronged with people during the entire four days. The special exhibit on the opening day consisted of diamonds, watches and jewelry. One of the features of the opening was the Oriental art room. In addition to the exhibits there was music by a band and also decorations and flowers. The auction sale now being held at the old stand of the Merrick, Walsh & Phelps Jewelry Co. by the Mermod & Jaccard Jewelry Co. is undoubtedly affecting the trade of the rest of the retail dealers. St. Louis, Mo., Aug. 11.—The will of the late D. C. Jaccard was filed in the Probate Court on the 8th inst. It was executed Feb. 24, 1898, and was witnessed by C. F. Mathey and A. E. Addor. Mr. Jaccard named his sons, Eugene G. Jaccard, Kansas City, and Ernest A. Jaccard, St. Louis, as joint executors, without bond. To his wife, Louisa A., he leaves all furniture, fixtures, bric-a-brac, etc., except a few articles specified. To the daughter, Mrs. Eugenie Perillard, of Lausanne, Switzerland, the deceased leaves certain portraits, his gold watch in trust for her son Rene, and $40 to purchase a watch for her younger son, Eugene. Other sons of the principal heirs are left sums with which to buy watches. The bulk of the estate is left to the wife and five children of the deceased. The value of the estate is estimated at $125,000. The stockholders of the Mermod & Jaccard Jewelry Co. will soon vote on a proposition to increase the capital stock of the company. The present capital is $500,000 and it will be increased to $800,000. The voting will be done July 3. The recent absorption of the Merrick, Walsh & Phelps Jewelry Co. is the cause of the increase. Opening Of The New Mermod & Jaccard Store.—The Mermod & Jaccard Jewelry Company last week issued an invitation to their friends and customers to assist in celebrating the opening of their new store, which has just been completed, at the corner of Broadway and Locust street. This took place on the 1st and continues during the succeeding days of the week and marks an epoch in the development of this house, which for more than fifty years has been under the personal guidance of its president, Mr. A. S. Mermod, and its vice-president, Mr. D. C. Jaccard. Special displays are being made each day, as follows: Monday, Diamonds, Watches, Jewelry. Tuesday, Art Bronzes and Marble Statuary. Wednesday, Silverwares for Wedding Gifts. Home and Personal Use. Thursday, American and Imported Art Glass. Friday, Ceramics, Art Potteries and Table China. Saturday. Art Furniture, Hall and Mantel Clocks. Music Boxes. The auction sale of bric-a-brac and art goods conducted by the Mermod, Jaccard & King Jewelry Co. for three months has closed. Messrs. Moody and Martin were the auctioneers, with successful results. Mermod & Jaccard Jewelry Co. have rented a store at the N. E. corner of Olive and 6th Sts., and will shortly open a branch store at that location. The Mermod & Jaccard Jewelry Co., St. Louis, filed last week a statement of increase of capital stock from $400,000 to $500,000. Goodman King, of the Mermod-Jaccard Jewelry Co., is Chairman of the Advertising Committee of the St. Louis Autumnal Festival Association which promises to surpass all its previous efforts at the fall festivals during the next two years. "That is the handsomest vinaigrette in this city,” said Mr. Bolt, manager of the repairing department at the Mermod-Jaccard Jewelry Company the other day, as he wrapped up the bijou and passed it over the counter. Miss Orth is the owner of this approved scent bottle, which is of English cut-glass, long and tapering in shape, square-cut at the sides, but with a rounding bottom cut in long rayed fans, the hipped top similarly finished and capped with a silver lid. At glance seemingly like many another long scent-bottle, but on examination easily recognized as unique in elegance and costly in workmanship, a fit trifle for the fair hands of an elegantly dressed woman in idle moments. Goodman King, president of the Mermod, Jaccard & King Jewelry Co., St. Louis, Mo., was in New York, last week, where he completed arrangements for the establishment of a New York branch for his house. Mr. King has just closed the lease— for a term of five years—of the premises at 400 Fifth Ave., where he will establish a distinctly up-to-date retail establishment, which will carry practically the same lines as are handled by the house in St. Louis. 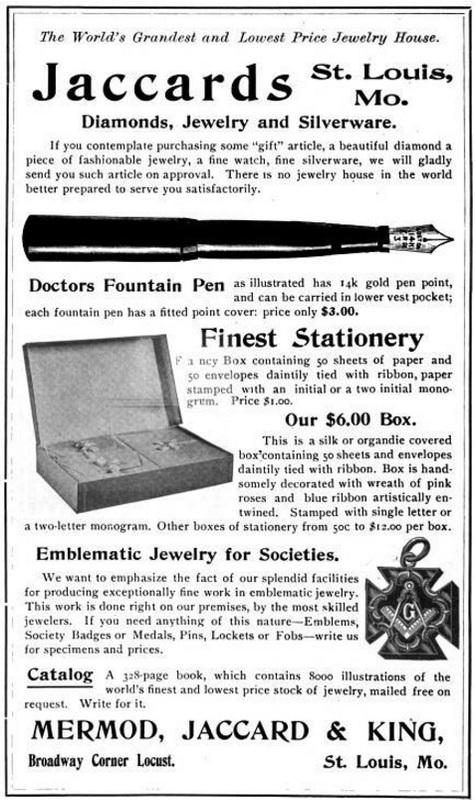 to cabinets and silverware, the next to gems and jewelry, the third to the art department, the fourth to silver hollow ware, and the last to the mail order department. On the upper floors will be the stationery and shipping departments, and also the diamond mounting and repairing factory of the concern. The company’s lease dates from March 1, but arrangements have now been made to begin the renovation and changing of the premises to meet the requirements of the business, and it is hoped that the concern will be established in its new quarters some time between April 1 and April 15. 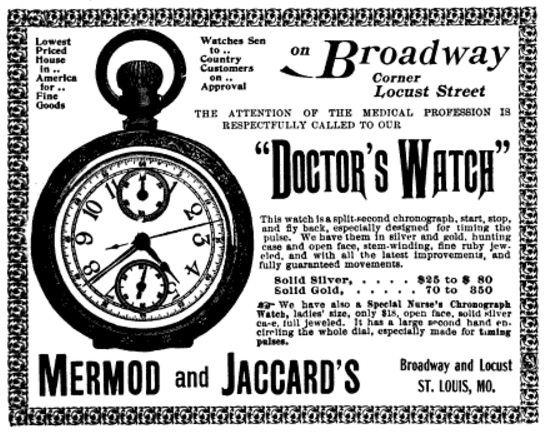 The Mermod, Jaccard & King Jewelry Co. is one of the largest and oldest houses in the trade, the present concern practically being the successors of three great firms — Mermod & Jaccard, the Eugene Jaccard Jewelry Co. and the Merrick, Walsh, Phelps Co., all of St. Louis. The Mermod & Jaccard Jewelry Co. closed its establishment, Saturday, to allow its 400 employes to attend the opening ceremonies of the Universal Exposition. Lee Sehum, of the Mermod, Jaccard & King Jewelry Co., has returned from a vacation trip. H. L. Fischaker, advertising manager of the Mermod, Jaccard & King Jewelry Co., spent last Sunday with a party of friends at Piasa Chautauqua. J. J. Menges, of the Mermod, Jaccard & King Jewelry Co., returned Thursday from a trip to New York and seashore resorts.